Socrates: Socialism, Capitalism, is there anything in between? 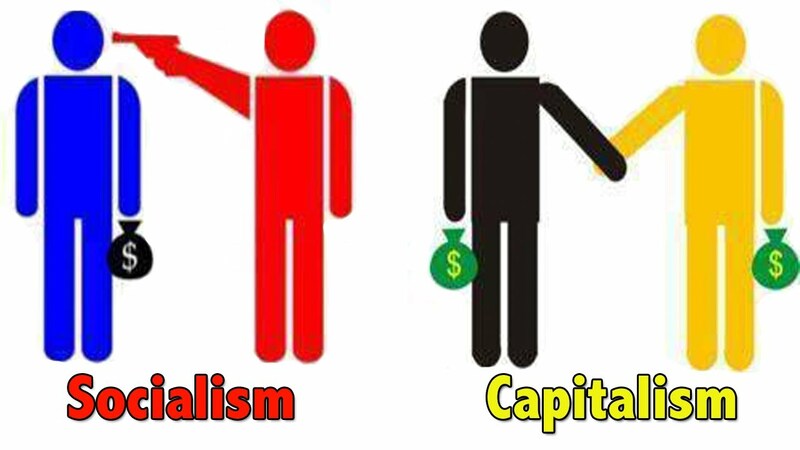 Socialism, Capitalism, is there anything in between? There is an election campaign underway in New Zealand. People familiar with my history will know my views on democracy. My student, Plato, built on my views and constructed an extensive criticism of the democracy of Athens. Democracy in New Zealand is different, but perhaps still suffers from the same problems I saw in Athens. Much of the campaigning is based on rhetorical tricks of language rather than rationally presented argument. There are some exceptions to this statement, of course. But overall, the person most clever with language wins the popular vote. They are sophists. They make bad arguments look good, and good arguments look bad. I suggest you read it first so that you can understand my criticism. Essentially, the article states, in a long winded way, that the leader of the New Zealand Labour Party, Jacinda Ardern, is a socialist. The author accuses her of using the word "comrade" in a speech 8 years ago. But apart from stating that it is a "marxist" word, he does not explain why this is significant. The tone of the rhetoric is clearly negative, but he doesn't make an argument. He simple states that she is a socialist and that this can be proven by, among other things, her use of the word "comrade" 15 times in a 2009 speech. C. Therefore, we should not vote for Labour. Now, perhaps it is true that Jacinda Ardern has socialist leanings. Does that make her a "socialist"? Perhaps. Does it make the Labour party "socialist"? Not necessarily. That doesn't follow. However, she will undoubtedly influence their direction. But this is only an issue if premise #1 is true. That is my question. Is socialism a bad thing? Maybe it is, maybe it isn't. I don't know. For all I know, socialism might be the best thing ever. So I think the author needs to explain why we should agree that socialism is a bad thing rather than just warning us that Ardern is inclined in that direction. I brought this point up in an online forum. My mission has been, and always will be, to examine people's beliefs. Elenchus is my method. In the elenchus, I attempt to question people's assumptions and disarm false premises. Here are parts of the dialogue, from where MR. K enters with an example of socialism working well. MR. K: Scandanavian socialism seems to work fine. Sadly, I think many people don't know the difference between socialism and communism. So they think that if communism is bad, then socialism must also be bad. MR. C: That's because generally speaking, socialism leads to communism. Why present Scandinavian socialism? Why not Venezuelan or Cuban socialism? Scandinavian socialism is actually in decline. The taxes have killed off business development (for example, Ikea) and people are demanding a move to a free market system with less tax. Especially with the influx of low skilled migrants. Also one of the reasons it worked there and not elsewhere is because of their work ethic and a great scene of social cohesion, and in some cases oil to prop up the welfare state. We have none of them here. Any system that removes the incentive for wealth creation or the ability to get ahead, will fail eventually. That's socialism for you. SOCRATES: We have no work ethic here? Oh dear. I think some hardworking people will disagree with that statement. Allow me to ask a simple question: Do we have a level of socialism in New Zealand compared to countries like the United States? MR. C: We have a capitalist system with a socialist cherry on top. SOCRATES: That socialist cherry has not lead us to communism, has it? MR. C: That's a bad argument. Ring fencing certain things within capitalism with a socialist agenda is not socialism. Thus its pretty unlikely to lead to a Marxist state. Flip the concept and you have a road to communism. SOCRATES: I didn't make an argument. I asked a question. And the answer is "no", right? MR. C: Okay. Fair enough then. MR. J: There's nothing wrong with socialism if implemented correctly. Unfortunately it has never actually worked because it seems to be contrary to human nature. MR. W: True, but the same could be said for Capitalism. Great in theory, but if implemented incorrectly it can have nasty consequences. And we've seen that happen. I don't think either is better or worse than the other. But the idea that Socialism is evil, or Capitalism is evil is too simplistic and doesn't leave much room for things completely outside our control, or even just the nature of human behaviour. I'm wary of anyone who tries to say "She's a socialist, so you should be scared of her!" MR. C: That old chest nut. My theory doesn't work because it hasn't been implemented property. In other words its a bad idea. If if doesn't work in the real world then it doesn't work. End of of story. Capitalism is the best system we have developed so far, but its been ruined by globalism and the non-productive financial sector. So it too doesn't work. But it works better than socialism (Marxism), that's for sure. MR. W: That's another "old chest nut", "Capitalism isn't perfect but it's better than socialism." I don't find that convincing. I think you'd be hard pressed to find a full capitalist state. New Zealand has a pretty free economy but we're not a fully capitalist state. As Socrates pointed out, compared with the U.S, we are quite socialist. We have a mixed economy. Welfare, public health, public schools - all forms of socialism, which sit on top of a market economy. SOCRATES: It seems to me that socialism vs capitalism is a false dichotomy. Is there not a continuum from socialism to capitalism? Compared to the U.S we are socialist here in New Zealand. If New Zealand is working well, then we can say that a level of socialism works, right? MR. C: If we removed the non-productive sectors from capitalism it would be far superior. Its superior anyway, but its the non-productive sector within it that has ruined everything. SOCRATES: By what measure do you rate superiority? MR. C: By international historical measure, it's superior to any other system available to us. SOCRATES: What is the nature of this international historical measure? MR. C: Creation of wealth (the ability to survive and prosper), access to healthcare (but I prefer the private model), and freedom of movement and expression. SOCRATES: A full user-pays capitalist system might fail on the healthcare side of things if low income earners can't afford it, right? But as far as wealth creation goes, that same system might pass with flying colors? Do they include wealth distribution within their measurement system? MR. C: I'm not suggesting that social programs are not beneficial for those at the bottom of the income ladder. They should exist for that purpose. Private providers don't care who is paying, just that they're paid. In contrast our public heath system is failing. The private sector is having to fix the problems. And its not luck that made me able to afford the insurance, it's hard work and a lot of it. SOCRATES: So a socialist cherry on top is a good thing. MR. C: I'd say its not a bad thing. But should be minimised. At this point the dialogue ended in aporia (unresolved). What I have learned is that people tend to speak in absolutes: socialism is bad, capitalism is good. But when the dichotomy is examined we find that it is a false dichotomy. In reality, there are aspects of socialism that people want society to retain. So it seems that premise #1 above has been disarmed. The general claim that "socialism is a bad thing" is false. It is a shame that politics involves rhetorically simplifying positions into false dichotomies. It is sophistry at work, and we should do our best to see through it. Examine it. After all, the unexamined life is not worth living.